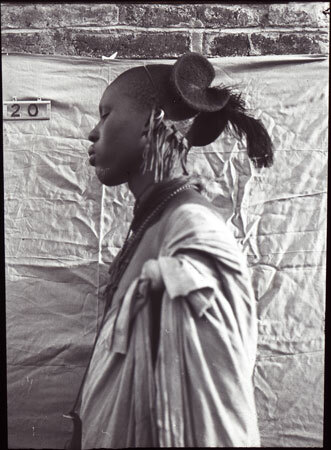 A physical anthropology upper body profile portrait of a Shilluk youth with elaborate coiffure and ornaments, probably photographed during the Seligman's enquiries at Kodok in late 1909. The number 20 can be seen pinned to the backdrop set up against the exterior wall of a brick building. Accession Book Entry - [1967.26] THE LONDON SCHOOL OF ECONOMICS AND POLITICAL SCIENCE, HOUGHTON STREET, ALDWYCH, LONDON, W.C.E. PER MR ANTHONY FORGE - SUDAN. Box containing 309 lantern slides (3 1/4” x 3 1/4”) made from photographs taken by the late Professor C. G. SELIGMAN in various parts of the SUDAN. All slides numbered and labelled. Catalogue in file (“Seligman Slide Collection”). Additional Accession Book Entry - [in pencil] 18 Parks Rd. Manual catalogue entry (thermofax catalogue copy in folder '27-06 Seligman Slide Collection') - "V.b.4. Shilluk type"
Note on lantern slide - "V.b.4. Sudan. Shilluk type. CGS." Morton, Chris. "Portrait of a Shilluk youth" Southern Sudan Project (in development). 03 Jan. 2006. Pitt Rivers Museum. <http://southernsudan.prm.ox.ac.uk/details/1967.26.21/>.